I finally got this watercolor and ink illustration up in my shop late last year and have sold quite a few prints of it so far. I was really into drawing kitchen items last year, I’m not sure why. Maybe because I spend so much time in my kitchen and I really do feel that it’s the heart of the home. I still have quite a few kitchen-related sketches that I’d like to turn into watercolor illustrations. But lately I’ve been doing more abstract work (you can see a few examples on Instagram) . . . so stay tuned for more on that! I just finished wrapping gifts in my new “Ornaments” gift wrap, available in my Spoonflower shop. I designed this pattern last year, but hadn’t seen it on actual gift wrap until my order came in last week. I’m thrilled with how it turned out! I wanted to do something modern and in non-traditional colors, so went with a wintergreen color scheme, inspired by a photo of a beautiful Christmas tree I saw on Pinterest. The paper quality is superb and there is an ample amount in each roll. I’m inspired to do more holiday patterns for next year and am thinking I’d love to design some wallpaper patterns as well. It’s been quite a while since I’ve posted here. Not sure how the past year flew by so fast! I have been actively creating and posting on Instagram, but have not been very attentive to my blog and hope to be better about that going forward. I was just down in Texas with family for a couple of weeks. My mom lives on the Guadalupe River near New Braunfels and it’s a peaceful place where I can really relax and unwind. It helped me get clear that I want to focus more on the things that really matter to me and one of those is creating on a daily basis. Luckily, I have this lovely studio space to do that in. We remodeled the upstairs attic of our small Craftsman bungalow 9 years ago and out of that I got this light, bright room with pitched roof, skylights, and built-in bookshelves. The flannel-covered pin board on the wall holds past work and work in progress. A good day for me means I’ve spent at least a little time here doodling, painting, or working on one of my ongoing projects. My new goal is to start each day with 30 minutes of creating. I’ll try to post here more regularly, but you can always tune into my Instagram feed and stories to keep up with what I’m working on! I've had a thing for black and white for about 10 years now. I think it all started with some black and white ceramic bowls I was given for a wedding gift. But maybe it was something brewing within me all the time, just waiting to surface. I've been slowly incorporating it into my decor more and more over the years. And it certainly has filtered into my artwork. These 3 prints are from my black and white botanical series, available in my Etsy shop. I love the way they look in this minimalist dining room. What's your favorite way to use black and white in the home? It's been a busy year, with not as much time for making art as I would have liked. However, I have managed to make some new pieces and am just getting around to getting them up in my Etsy shop. I've also been playing around more with watercolor and incorporating that into my pen & ink drawings. 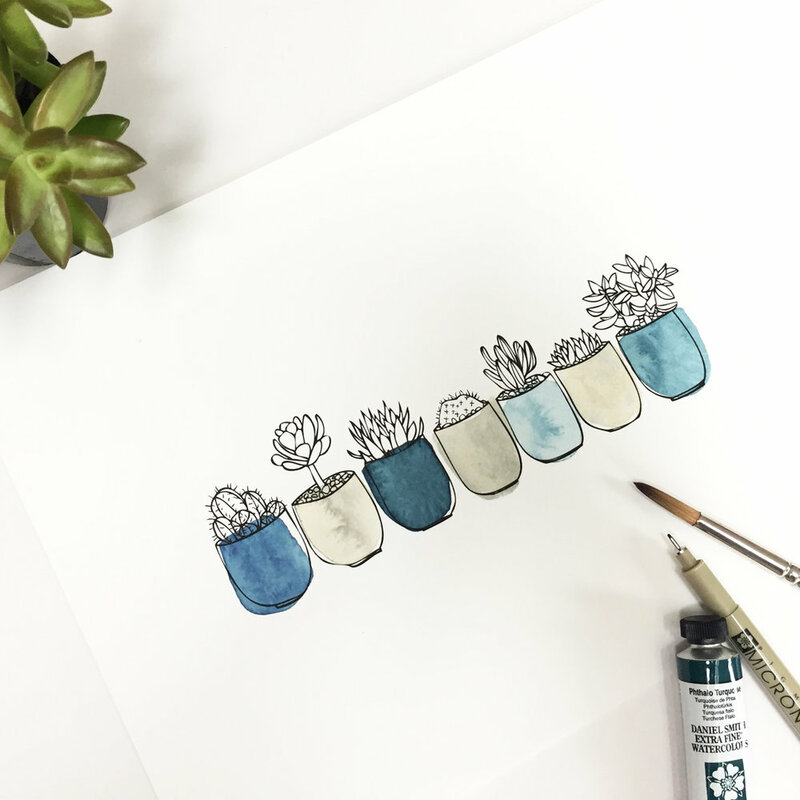 This drawing of a row of little succulents in pots is one of my first experiments in that direction. After a lot of playing around, I've settled on Daniel Smith watercolors as I love the texture I get with those. I'm hoping to add at least one additional color option of this one soon! One of my big art goals this year was to start selling my work online. So I'm thrilled to announce that my work is now available in my Etsy shop! 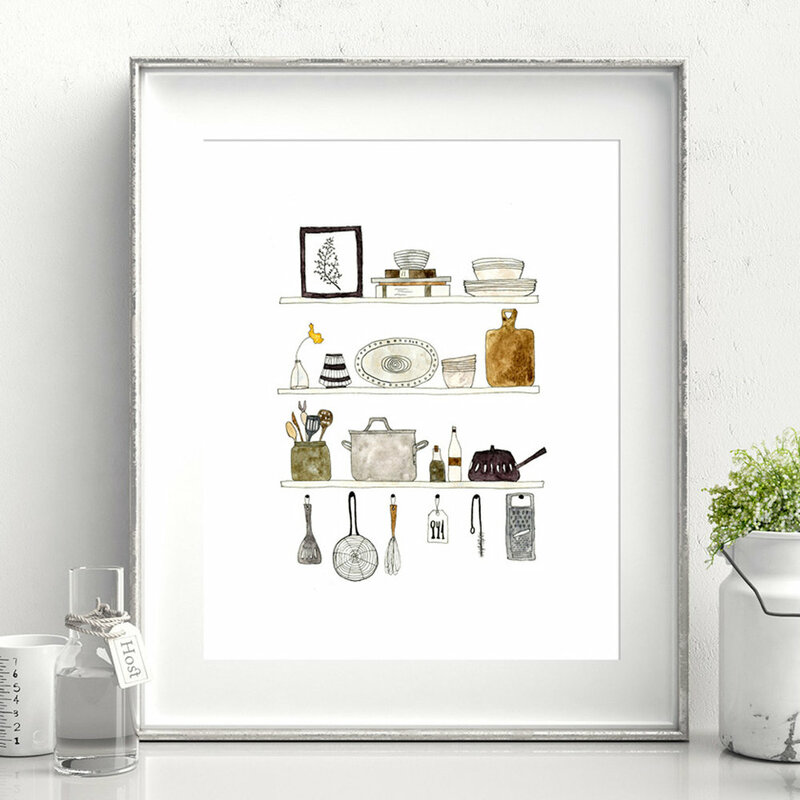 It features all of my art prints, including botanicals, maps, and digital collages. I'll be adding prints throughout the year as I continue to create new work. I started the process of setting up my shop early this year, doing product photography and ordering supplies as time allowed. I was finally able to pull it all together last month and have had my first few sales already. 2016 has been a big year for getting my art out into the world - can't wait to see what 2017 brings! Happy 2016! I can't believe it's here already, but I've started out with a bang, working on new illustrations and a website revamp. In my last post, I promised to share my entry for the Spoonflower Fabric 8 competition. Here it is, on the left. I wasn't selected for the semi-finals and was disappointed at first, but decided to use it as a learning experience and played around with different pattern layouts using the same or similar motifs. I ended up with the pattern on the right, which I like much better. I doubt this one would have been selected either, as it doesn't really fit the vintage vibe they were looking for, but it's true to my style so I'm happy with it. I'll be sharing some of my new illustration work soon, so stay tuned! This year I've been doing some drawing every day and have been focusing on sketching botanical elements, mainly weeds, seeds, pods, and leaves. These drawings are influenced mainly by my daily walks with my little dog, Belle. Once I started noticing pods, I was amazed by the variety I found and how they change with the seasons. I've now amassed quite a lot of botanical motifs and am working on incorporating them into a series of art prints and fabric designs. I start with black ink sketches as show below. I also often find it helpful to sketch in pencil first to get a feel for what I want to draw. Sometimes I trace over my pencil lines with ink. I've just completed a design for the Spoonflower Fabric 8 competition which I'll reveal soon! When I looked back at my design accomplishments in 2014, I realized that I'd done a lot. I got my designs up on Kess In House in April, completed another series of designs for Kess in July, and started a range of art prints (to be revealed later this year). However, one thing I was missing was drawing on a regular basis. One of my New Year's goals was to draw one thing every day, even if just a little scribble. Momentum is the key word here. For some reinforcement and motivation, I signed up for Lilla Roger's MATS Bootcamp. Lilla sends out a mini assignment every month and then a "big" assignment one week later. This month the mini was to draw Edwardian brooches. And the big assignment was to use those drawings to create a journal/notebook cover. I was most drawn to the bug brooches, so here is what I ended up with. I have loved getting back into drawing again on a daily basis and look forward to seeing where that leads!